I would like to thank Kim from Cook It Allergy Free for the inspiration for this salad. 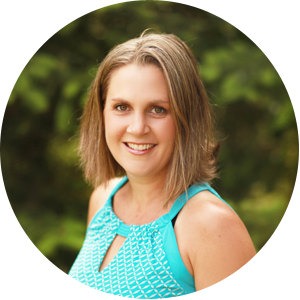 I can’t tell you how wonderful it is to have blogs like hers out there that cater to multiple food allergies! What a lucky day we live in to have all sorts of wonderful, idea-inspiring resources out there for us. It helps you feel just a bit less isolated in your food allergy journey. When I first saw her salad, it looked SO unusual, I just HAD to try it and see how it all married together. I absolutely love sweet and salty combinations, and this was too colorful not to work with! Her original recipe used pineapple, and that is one of the fruits I need to forgo for awhile, but I thought mango would fill in nicely…and boy was I right!! I could eat this salad everyday, it is so scrumptious, and so beautiful to look at. I love to eat it for my lunch and make a pig of myself eating a whole bowl…it’s just so darn good! So even though it might sound a bit weird…just TRY it, and then see for yourself! Blend all the dressing ingredients in a blender. Thin with water to desired consistency. Assemble salad ingredients and top with dressing! I’m in love with this salad! The mangoes are AMAZING this time of year…and this salad is such a great and surprising combo!! Thanks Annie! 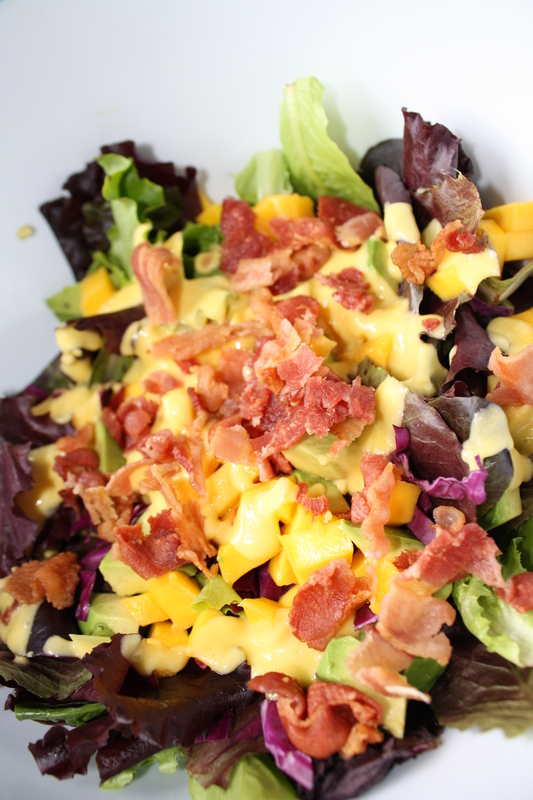 This must be a salad of contrasts with the sweetness of the mango and the salt of the bacon. It is being featured this week at My Meatless Mondays. Oh Tessa, this salad looks amazing! I love the salty / sweet flavourings it has going on, and it’s absolutely beautiful to look at too. I’m going to feature this on my Hearth and Soul post this week. I hope you don’t mind me ‘borrowing’ the photograph to do so. Have a lovely week! Thank YOU April, I’ll look for it! This looks so yummy. I have to make it without the bacon but I have a feeling, it still is going to be delicious. I have printed it up and if I get mangoes, I will make it for dinner. Yay sunny! Glad you guys liked it too! So, My hubby is vegetarian. What can I replace the bacon with? 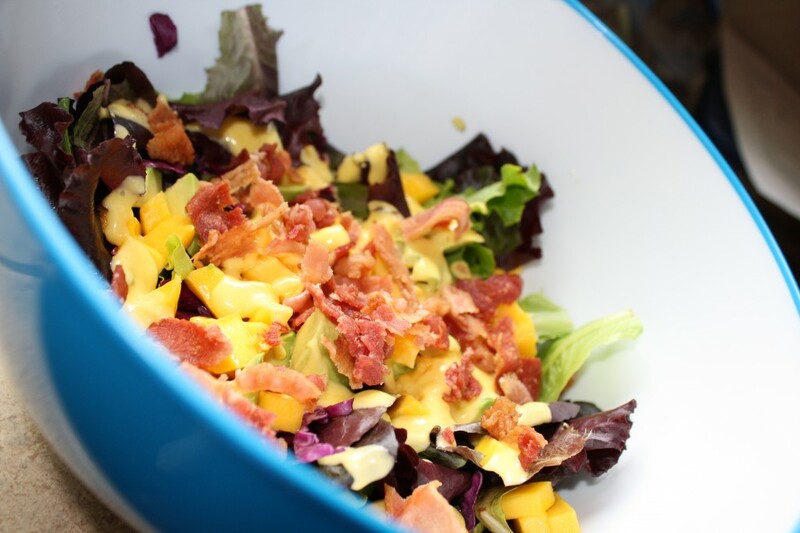 He is a huge mango lover so I know he’ll love this salad… just not sure about the bacon! Thanks for sharing this awesome recipe at Sugar Free Sunday! E it out and add sun roasted sunflower seeds for some crunch if you want! mmmm, this sounds great! AND I have everything in my kitchen for it. I see a mango & bacon salad lunch being added to the menu! 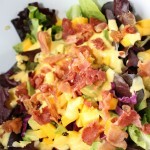 What an awesome salad, I just love Mango and the addition of the Bacon will put this over the top. Hope you are having a great week end and thank you so much for sharing with Full Plate Thursday. Tessa! this looks great – pinned! thanks for linking with kids in the kitchen! Fruit + bacon = YUMMY! Thank you for sharing this. Of course Beth, hope you try it! We had it for dinner again tonight! Yummy, looks really good! Very inspired to use mango instead of pineapple, it probably tastes better that way! Thanks for sharing this with Summer Salad Sundays, look forward to seeing you again soon. What a beautiful and tasty salad! Love the mango in the salad and in the dressing as well!